Political parties know that not enough women are standing in political positions. Mag the Blag wants them to ask: why not? All the main parties want to boost their numbers of women and they want more of us to stand for political positions. But they rarely venture into the messy territory of personal issues to find explanations for why women are so under-represented in their parties. It’s not easy to find someone in party politics who’s open about personal issues but luckily I come across Ruth, (not her real name) who’s willing to talk to me. Ruth is a middle aged professional woman, confident in her role of party political activist. Nevertheless I get the sense that she feels a bit uncomfortable. I started by asking if political choices can be compromised through relationships with men. The answer was definitive: absolutely. She told me that in her younger days, before she joined a political party, she was a journalist and married to photo-journalist. “He was good looking and people would look at me, a fat woman with this drop dead gorgeous guy, and it felt like they thought I didn’t deserve to be with him. I always felt less than.” I can sense a hint of vulnerability behind Ruth’s words, as if part of her had returned to an earlier version of herself where she did not value herself. Ruth told me she found herself unable to question the page 3 culture that was prevalent in the publishing world that they were both part of. “I assumed you could only complain if you were young, beautiful and thin.” This combination of a sexist culture and lack of self-esteem meant that Ruth was left without a voice. This is a classic co-dependent dynamic. One definition of co-dependence is: “You cut, I bleed.” Ruth worried that her husband might feel diminished because of her greater earning power so she spent her emotional energy protecting him, to the detriment of her own views and needs. The irony was that her husband couldn’t care less about earning less than Ruth – in fact he was proud of her. But this made no difference. “I was so busy trying to get it right that I didn’t have time to think about my own views.” Luckily for Ruth she didn’t go so far as to leave her high-earning job. At about this time of her life Ruth joined a political party. She went on anti-racist marches and campaigned against poverty. But Ruth tells me that it never would have occurred to her to bring up body size or the sexist culture that dominated the media view of women. One woman’s story does not an explanation make. However, these are all commonly reported problems that reduce women’s potential to be part of political life: co-dependence prevents women from focusing on their own issues, lack of self-esteem is an internal censor that inhibits self-expression and body image issues act as a barrier to standing for political positions. Unfortunately we’re not at the point where the mainstream political parties are willing to take on these personal issues and how they’re the affected by the sexist culture we live in. At the level of party politics, the personal is still deeply apolitical. Feminists have their work cut out. The image is by Aslan Media and is used under a creative commons licence. It shows a red background with a white political crest and white writing reading “MEN POWER AND POLITICS”. 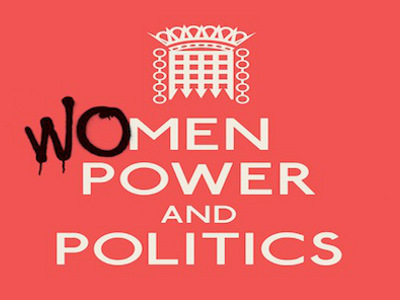 Black graffiti writing adds “WO” so it reads “WOMEN POWER AND POLITICS”.